Thursday October 22nd 1903 I got my morning work done and a nice dinner ready. Mother, Aunt Fannie, Hattie & Otts boys were out for the day. We had a nice visit. I talked with Mollie all evening. I was very tired I had a letter from Lydia Mason. Her father & \Mother started to Oklahoma on Tuesday. Friday October 23rd 1903 I went to town early this morning, did a little trading and went to the Dr office. I got my dinner over and worked all afternoon making quince preserves and jelly and fixing my pickle. Mollie went home. 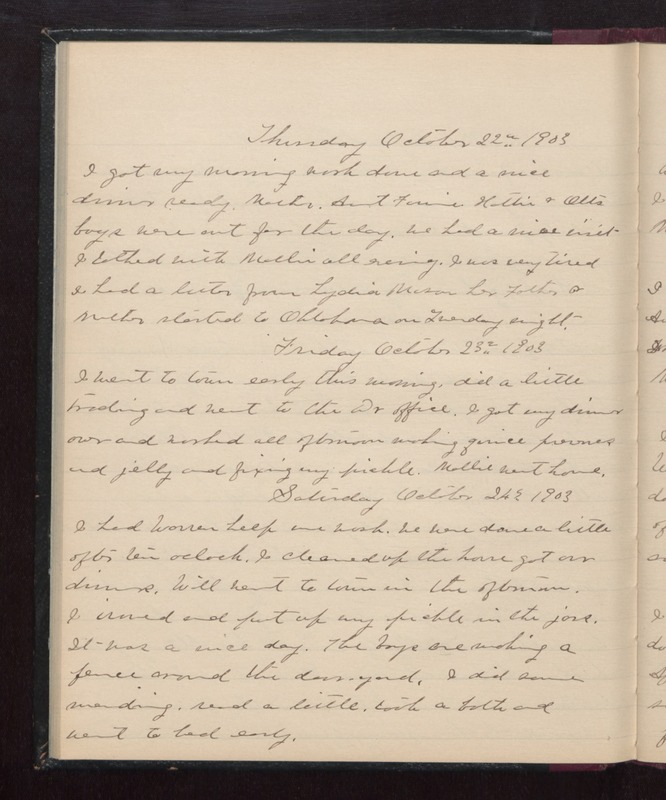 Saturday October 24th 1903 I had Warren help me wash. We were done a little after ten oclock. I cleaned up the house got our dinners. Will went to town in the afternoon. I ironed and put up my pickle in the jars. It was a nice day. The boys are making a fence around the barn yard. I did some mending, read a little, took a bath and went to bed early.